In the year since we launched, over 550 charities and voluntary groups have pledged to Keep Volunteering Voluntary. 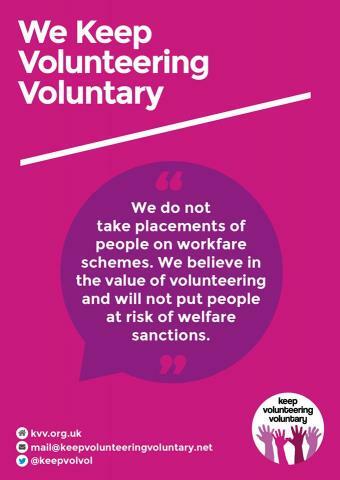 Together we are highlighting the value of volunteering and building a strong consensus that responsible voluntary organisations will not take part in workfare schemes and put people at risk of devastating welfare sanctions. Thanks to your support, Keep Volunteering Voluntary was recently named Guardian Charity Campaign of the Month! But the new government was elected with a pledge to send 50,000 more unemployed 18-21 year olds on workfare placements to charities and voluntary groups. That’s why it’s more important than ever that we use our collective voice to Keep Volunteering Voluntary. If you can’t make it to the meeting, but would like to get more involved with the campaign, please reply to let us know you’d like to help! IN DEFENCE OF YOUTH WORK is signed up to the Campaign. We would encourage all our supporters to muck in if at all possible.